Pokon Platinum for the Nintendo DS is a dual-screen portable Pokon adventure that sees players exploring the Sinnoh region with a host of new features and Pokon! In the singleplayer story of Pokemon Platinum version, would-be Pokemon trainers will enjoy loads of exploration across the icy cold Sinnoh region, and battles against the evil Team Galactic - but that not all Pokemon Platinum Version has to offer! 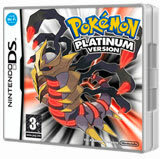 As well as a great singleplayer story, Pokemon Platinum Version offers players the chance to Battle Em All online in the Wi-Fi Plaza, plus trade Pokemon and play minigames making this a truly global handheld phenomenon! Originally debuting on the humble GameBoy, Nintendo's Pokon series has spawned cartoons, toys, trading cards and even full feature-length movies. But it's still the games that matter most to its legion of adoring fans. Here youl find our back catalogue of Pokemon titles, giving you classic adventuring for your Nintendo console, plus loads of other great Pokemon merchandise that will be a must-have for Pokemon fans!